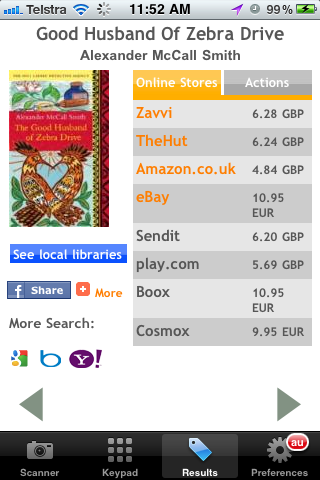 I’m a librarian in my day job, and I love my iPhone so recently I’ve been exploring ways I can use it to search library catalogues and in bookshops by scanning the ISBN barcodes you find on the back of books and even by scanning the library barcodes that libraries stick into their stock. On the way I’ve also found that you can generate the barcodes from your membership and loyalty cards so they display on and can be read from the screen of your phone. Not all of this works perfectly yet, but there’s enough working successfully to make it worth a go… so if you’re in the profession, be ready for customers waving the phone at you rather than their library card! I first found out about using the iPhone as a barcode reader a few months ago (I think it was on a local librarians’ email list). As long as you’ve set your country preference, it will pull up records from WorldCat .Click on the library name and it will take you to the library catalogue. 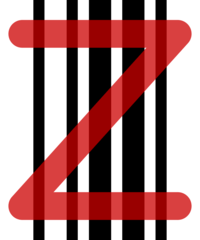 My favourite barcode reader so far (and I’ve not done a mass of reasearch) is ZBar – it’s free and easily customizable, even by amateur geeks like me! I found out about ZBar by Googling for information on using iPhones as barcode scanners in libraries. The best information was in a great post in Aaron Tay’s blog Musings about librarianship – How to check your library catalogue by using your IPhone as a free barcode scanner – ZBar & RedLaser. His instructions for setting up ZBar are really clear so I won’t repeat them here! I played around with customizing it search the State Library of WA’s catalogue using ISBNs. Quite easy to set up using Aaron’s instructions but I did have some troubles as some of the information required to display the results correctly (for the technically minded it’s the scoping data ) was in the suffix of the search URL. i.e. the ~S2 has the same function as searchscope=2. It works, but I’m prepared to be corrected by the experts if there’s a reason you shouldn’t do this! 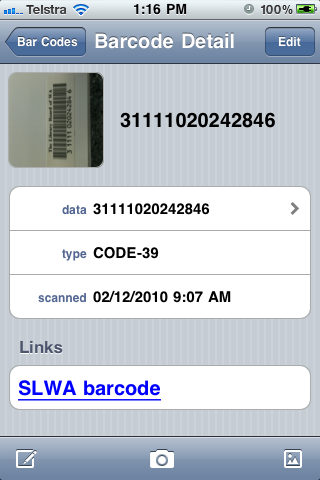 The only downside is that I can’t get the camera in the app to lock on to the very long Code 39 barcodes used by the library – it may be better if you’ve got an iPhone 4! There is a slightly cumbersome workaround – go into camera, take a picture of the barcode (use landscape mode and tap to focus, zoom may also help). Then open the ZBar app and instead of using the camera icon in the centre of the bottom taskbar, use the picture icon (mountains in a frame) on the right hand side – you can then select the picture of the barcode and proceed as normal. I’m going to contact the app developers about this as it seems to me to be the way the app uses the camera that is the problem. You can use the same search strings when setting up custom apps to search for ISBNs at libraries and bookshops using RedLaser (only for the ISBNs, RedLaser won’t read Code 39). Note that if you are using a later operating system for your iPhone you’ll need to use the send icon in the middle of the toolbar to save the app, rather than the suggested +. At time of posting RedLaser has a glitch where you get a blank screen after scanning. 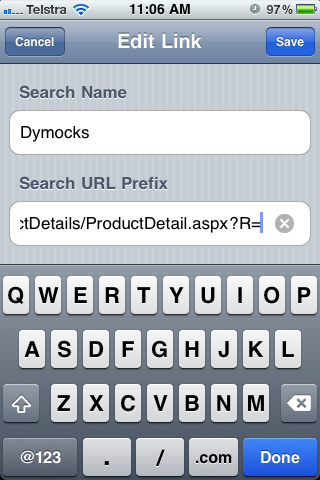 You’ll need to use the send icon and select “Open with Safari” to see the result (this has been reported by others to RedLaser so should be fixed in a future update). Now, from identifying media to identifying clients – as mentioned before I’ve had a play with CardStar – again this hasn’t been developed as a library app but it does enable you to create a virtual library card on your iPhone. At the time of writing the option to scan the card in is freezing the app [it’s fixed! 21 Dec 2010], so it’s “type in the numbers and try different symbologies until the image on the screen matches your card” time! I’ve generated a whole bunch of virtual cards, which I won’t show here (nice though it would be) as I’d like to keep my identity private! I have tried scanning a CardStar generated library card with two different barcode readers – an old one read it perfectly, the newer more powerful scanner wouldn’t read it at all, so this isn’t yet a complete solution – however it does point to future trends that the profession need to keep an eye on!